Dale Lamphere stands near his newest work, "Dignity," which is scheduled to be placed at its resting location in Chamberlain in September. Sturgis artist Dale Lamphere talks with James Borglum, grandson of Mount Rushmore sculptor Gutzon Borglum, near Lamphere's "Dignity." Ramona Herrington attended the reception Sunday with her granddaughter Sayna Trujillo, both of Rapid City. Sayna was one of the faces on which Lamphere drew inspiration for the young Lakota girl in his sculpture. Brooke Loobey stands near the stainless steel diamonds that will make up the sections of the star quilt on "Dignity." Loobey painted the diamonds at his auto body shop. Brooke and Lorrie Loobey talk with "Dignity" sponsors Norm and Enuabel McKie. Individuals in the foreground are dwarfed by the "Dignity" sculpture. Lamphere said the structure of the work is patterned after an umbrella. You can see the large supporting beam in the middle with arms stretching out to support the star quilt. This is what the back of the finished star quilt will look like on the Dignity sculpture. The giant foot of "Dignity." Just south of the Cheyenne River breaks, as you ascend southward, you can see a tiny American flag fluttering atop the arm a construction crane. The crane seems curiously out of place in the rugged rolling terrain of Badlands country. But as you drive closer, just beyond the newly cut hay, the crane's purpose becomes clear. It's the workhorse of Sturgis artist Dale Lamphere. 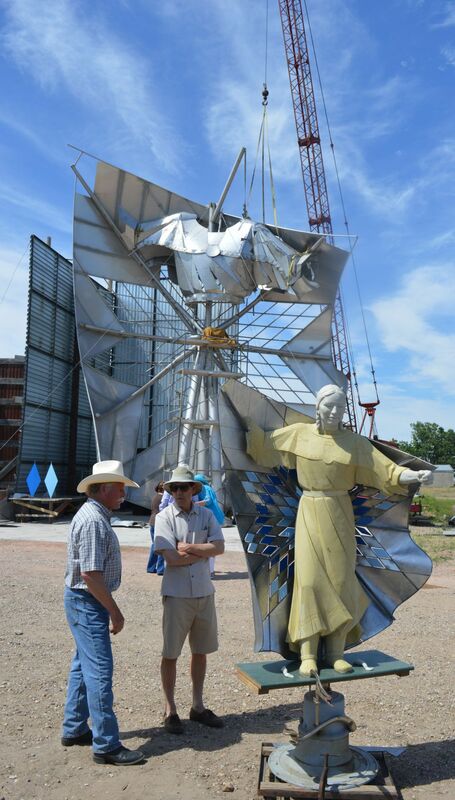 Upon completion, "Dignity" will tower nearly 50 feet in the air and stretch 32 feet across. It will grace the breaks overlooking another river, the Missouri at Chamberlain. Lamphere and sponsors of the project, Norm and Enuabel McKie, hosted a project update reception Sunday at the Sealine and Trople Spirited Winds Tatanka Ranch east of Rapid City. Tom Trople has taken the lead on piecing together the sculpture at the ranch. He and Lamphere have worked together nearly 30 years. "We've created a number of large-scale pieces, and he is the reason that happens. We've really formed a good team," Lamphere said. “Dignity," Lamphere said, represents the courage, perseverance and wisdom of the Lakota and Dakota culture in South Dakota. "My hope is that the sculpture might serve as a symbol of respect and promise for the future," he said. "The client's intent is to honor all the people of South Dakota, and particularly the Native culture. And to inspire the younger generation." For months, Lamphere and his team have worked with an engineering firm and Native American advisers to be certain the work is structurally sound and culturally appropriate. They began production of the full-scale sculpture, starting with the support structure and the star quilt, last summer. A central stainless steel pipe armature bears the weight of the quilt, made of over 100, 4-foot diamonds, and the fabricated sculpture of the woman. To reduce wind resistance, the wind moves through the diamonds and the perforations of her dress. Brook Loobey of Sturgis is the painter of the triangles in the star quilt. Half of the stainless steel diamonds are dark blue and half are light blue. Lamphere went to a paint supply store in search of the perfect colors, then brought the paint mixture to Loobey who provided the artist with samples. "We would take them out in the sun and hold them up together and look at them," he said. "Finally he arrived at those two colors, saying, 'This is it.'" Loobey estimates there are 6 to 10 different pigments in each of the colors. At different times of the day, the colors take on new dimensions, Loobey said. "In the shadows or at night, that dark blue looks really dark blue. And when the sun hits it, it will lighten up," he said. The sculpture, made of stainless steel, is being constructed so that air flows through it on all levels. The star quilt, which will be 32 feet across, will have 128 separate diamonds that make up the pattern in the quilt. They will freely move on a bearing spindle system. "I want something that people have not seen before, and that has durability into the future," Lamphere said. "If it were just another large-scale classic figurative work, I don't think it would have that level of interest or fascination." The dress is patterned after a two-hide Native dress of the 1850s. Doree Jensen of Rapid City, a native of the Pine Ridge Indian Reservation, was struck by the beauty and grandeur of "Dignity" on Sunday. "It's just amazing. It's beautiful. It's a great honor for our people. I'm happy that someone would think to do this in honor of us," she said. Ramona Herrington attended the Sunday reception with her granddaughter Sayna Trujillo. Both are from Rapid City and Sayna helped inspire Lamphere in creating the young Lakota girl in his sculpture. Sayna just happened to accompany her grandmother to a Community Conversations meeting that Lamphere also attended. Herrington said Lamphere saw Sayna and thought she had features that he could use in the face. Lamphere took pictures of Sayna and then she and her grandmother visited the ranch studio. "He said he had been looking for somebody and couldn't find them," Herrington said. "He saw her and said that was the face he wanted." Sayna is a sophomore honor student at Central High School in Rapid City. "It's cool," Sayna, 15, said as she peered at the sculpture. Lamphere says his goal for the artwork is to speak with dignity to people like Sayna, the future generations. "We hope it will inspire them to make the most of their life, to reach for a higher vision," he said. "If we can accomplish that in some small part, then it will be a great success."